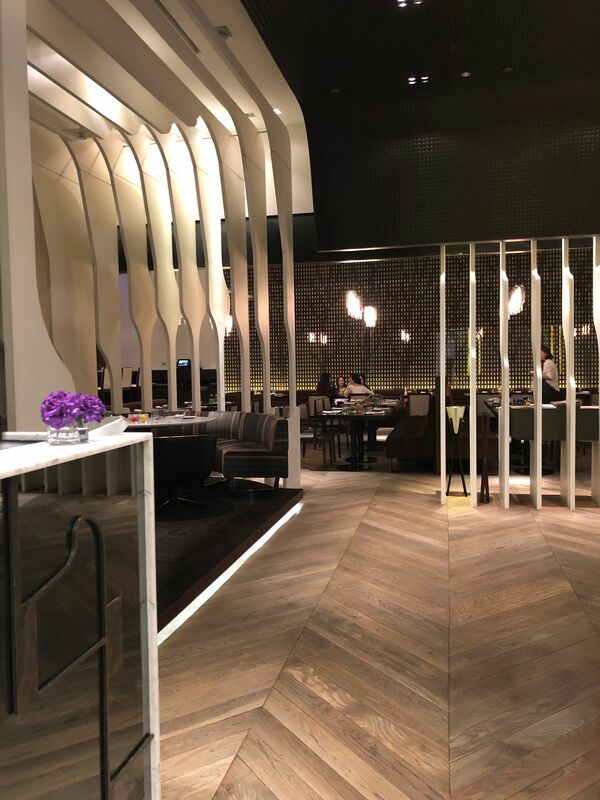 Opened since October 6, 2017, TABLE by Yoji is a contaminated Italian restaurant pop-up located inside the 4th floor of Taipei 101 building between the stores Louis Vuitton and Bvlgari. This restaurant is operated by a 3-year Michelin-starred chef in Paris, Yoji Tokuyoshi. The pop-up duration for TABLE was set to end in January but has been extended until the end of April this year. This is me posing with the TABLE sign. Chef Yoji Tokuyoshi: Mr. Tokuyoshi’s Italian dishes are infused with Japanese culture. His philosophy for his food is “contaminated Italian cuisine” as mentioned above. He calls it “contaminated” because he respects the Italian culture/dishes and feels as if he has “contaminated” the cuisine by adding his own touch to it. He re-creates his childhood memories onto his food presentation and therefore making his dishes abstract and meaningful. Even though Yoji is the main chef, his sous chef Kunihiro Hagimoto is basically left in charge of the pop-up and is at the restaurant in the kitchen most of the time. I’ve added a picture with him in it at the very bottom. Let’s take a look at the menu. Click here for their lunch menu and here for their dinner menu. I went during lunch and chose the $1600NT (~$54.93USD) set. Some of the best quality bread, from LALOS Bakery, are served during lunch and house-made bread is served during dinner. I got to try three tasty flavors of bread from LALOS Bakery. Some of these dishes come with a pairing drink. Each drink has it’s own unique flavor that is supposed to be sipped with a bite of food. Every dish has its own distinctive taste, ones that you wouldn’t expect. Sustainable Vegetable Soup 大地蔬菜湯 (not pictured) was brought out first. The soup is made of unused parts of vegetables and water making it very healthy. It was surprisingly very sweet and refreshing without extra seasoning or flavoring like salt and sugar. Polenta in Baby Corn 蟹肉玉米筍: The filling is made of cornmeal and crab stock and is packed into baby corn. Daikon Roll 大根捲: The filling is made with octopus and is wrapped in thin sliced daikon and zucchini. Fish and Chips 台灣番薯片佐鮭魚: This dish consists of fresh salmon slices on a fish-shaped chip made of sweet potato. Let’s look at the “Antipasto 開胃菜” dishes. The dough of this next Antipasto dish is made of polenta and rice. It’s almost like the texture of a shrimp chip. All the ingredients on top of the dough and the pairing drink together made this dish taste like, well you probably already know, pizza! Next, let’s look at the “Primo Piatto 前菜“. You can choose which pasta you want to order. Now for the Secondo Piatto 主菜, you can choose from Octopus Meets Napoli, Lamb in Hollandaise Sauce, and Dry Aged U.S. Beef. Palpo Incontra Napoli (Octopus Meets Napoli) 🐙: Do you notice what the colors of this dish represent? Italy! Last, the set comes with dessert a.k.a. Dolce 甜點. Noce di Cocco e Avocado (Avocado and Coconuts) 森林中的奶油: this dessert consists of avocado ice cream, whipped cream, coconut shreds, and some berries covered with thin chocolate crackers. You can also choose coffee or tea at the end. I chose coffee of course! Special thanks to Joyce for being kind and patient in explaining each dish and to TABLE for an amazing experience! Update: TABLE recently created a new menu, so go check them out before it’s too late! Click here for TABLE‘s most updated menu and pricing. The current two set prices for lunch are $880NT (~$30.10USD) and $1800NT (~$61.56) and the prices for dinner are $1800NT (~$61.56) and $3000NT (~$102.60). Next Lacuz Thai Fusion Cuisine, Lacuz 泰食-樂 泰式料理餐廳 – It’s AYCE Thai-m!